Kent's "Hooligan Libertarian" Blog: "Not to worry. 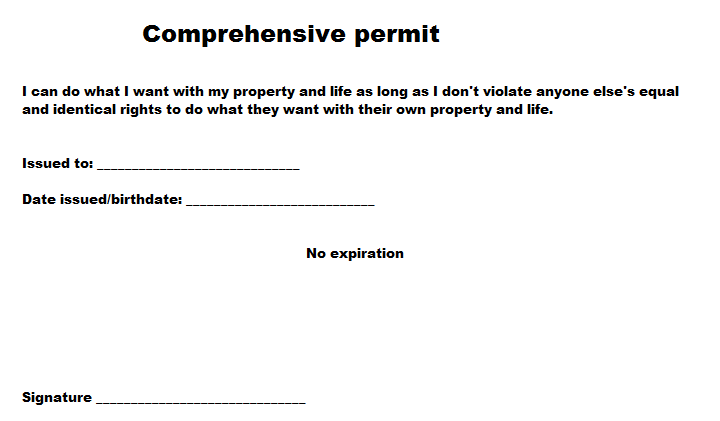 I have a permit." 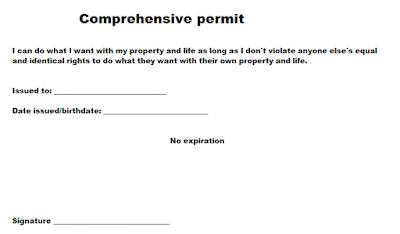 Contrary to popular opinion, I believe the state has the obligation to require permits and fees from people using their lands and resources. Yes, the very idea of a state is anathema to liberty, but the reality is one exists and is charged to maintain certain resources (like muh roads) and this maintenance, which also includes insurance, has a cost. Government owns nothing. Everything government claims was either stolen from the rightful owner or bought with stolen or counterfeited money. A thief doesn't own what it possesses. If I can opt out of paying for government "services" that I'd rather not pay for, then I won't object. I am forced to pay road "taxes" when I buy fuel, and I'm not allowed to opt out. If a private owner allowed highwaymen to infest his roads and rob travelers, I would shun his services. If poor maintenance allowed my vehicle to be damaged, or me to be injured, I should be able to recover damages from the road owner. When I am forced to pay for something, I expect accountability. Our descendants will be amazed we settled for "government" roads.